Can you believe it? We got EIGHT INCHES OF SNOW!!! Let me tell you, eight inches here translates ro ughly to about 4 feet in Idaho....... schools, stores and business close, power goes off, trees break and fall, roof collapse and the roads are deadly...... it was really something. 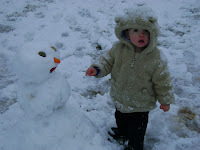 Of course having a rowdy 21 month old makes it a little more fun (NO, I do NOT miss the snow). 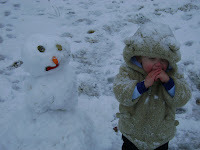 Jaydan was really mesmerized by it all and had a lot of fun eating it and building a tiny snow man. And then, once his hands got cold, it was over and he quickly dissolved into screaming, bawling hysterics convinc ed he was freezing to death...... like me! My office did NOT close.....thank you Governor Perdue (again) but I decided that taking a vacation day was worth not having to be anywhere near 4 million idiots on the road who have never driven in snow and don't know what snow tires are. Here are some fun (?) 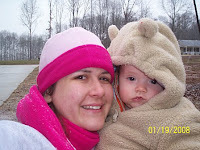 pics of us playing in the snow! 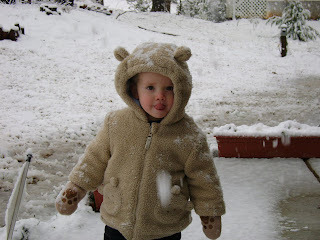 I couldn't resisit including one from last year when it "snowed" about 1/2 an inch! 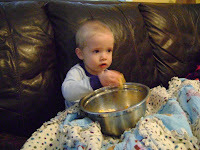 I think we can all agree that warming up with a movie, popcorn and hot cocoa is the best part!